Enjoy a Sunday afternoon at the movies. 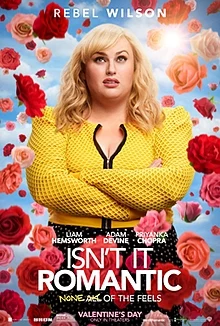 We will be watching Isn’t It Romantic. Movie time will be at 12:45pm. Please plan to meet at 12:25 in the lobby. Tickets will be purchased individually at the theater. Unfortunately have to bail on this one...I’ve got a sinus infection and cough that just won’t quit. I’m a definite maybe hopefully absolute yes!. I really really want to come and will be dependent on something out of my control at the moment!